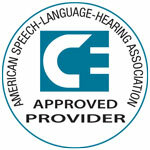 Ethics for Speech-Language Pathology and Audiology is a new 2-hour online continuing education (CE/CEU) course that examines ethical issues that Speech-Language Pathologists (SLPs) and audiologists may encounter in clinical practice. Ethical decision-making is based on awareness, intent, judgment, and behavior. 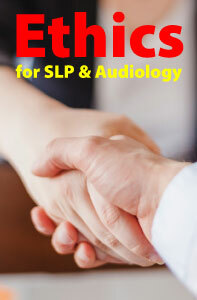 The speech-language pathologist (SLP) or audiologist must be aware that an issue has ethical significance. Then a judgment must be made with the intent to make the ethically correct decision, and action taken. Ethics is about deliberate decisions made to benefit the people involved or to have the least harmful repercussions if a positive outcome is not possible. This online course provides instant access to the course materials (PDF download) and CE test (you can print the test to mark your answers on it while reading the course document). Successful completion of the online CE test (80% required to pass, 3 chances to take) and course evaluation are required to earn a certificate of completion. Click here to learn more.